There's a reason why our driving lessons in Romford have such an amazing reputation - each one is tailored completely to each individual pupil, with the main aim of getting you to test level as quickly as we can. Your instructor will be CRB checked, fully qualified and dedicated to helping you become a strong and confident driver. Teaching you to drive isn't just taking you out in a car for an hour - driveJohnson's recognise that there's much more to it than that. Your instructor will support your learning journey by starting in areas such as Heath Park and Collier Row, before moving onto busier roads like the A12. They'll give you inside knowledge on test routes used and every manoeuvre you'll need to know, as well as equipping you with a progress tracking app and free online theory test training. We really are the only driving school in Romford that support you in every way, to make you the best driver you can be. 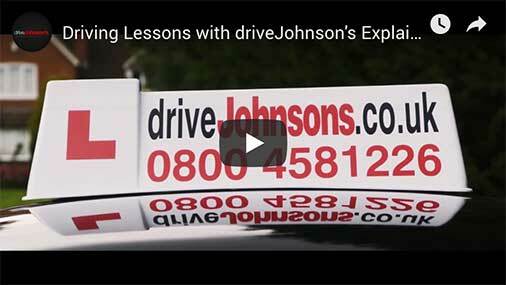 How much do driving lessons cost in Romford? I would like to say thank you to driveJohnson's office team firstly for allocating me Saadat. They listened to my requirements over the phone and assured me Saadat would make me feel comfortable and less nervous. I had a bad experience with another company so I really didn't want my confidence being knocked anymore. Thanks to Saadat for making the lessons very clam, productive and every lesson I walked away feeling like I had learnt something new. I passed first time because of Saadat, he prepared me for the driving test nerves so on the day I was still nervous but not crumbling like I usually would have under exam conditions. Thank you! Andy is a fantastic instructor! He constantly pushed me and made me perfect every aspect of my driving in time for my test. I passed with just 3 minors and they were really silly things because I crumbled a bit with the pressure. I would 101% recommend you take your lessons from Andy - you will pass in no time!! Andy is a great instructor who helped me pass my test first time with only 2 minors. He has a very professional manner and pushed me to improve my driving each week and progress. Andy is an all round nice guy and brilliant teacher. Would highly recommend to all! I passed first time with Andy and enjoyed every one of our lessons. A friendly and calm instructor with great driving techniques. Every drive i felt safe and reassured by him. Would highly reccomend to everyone! Great driving instructor and even better man. Very calm, humble and kind. Teaching style suited me well. I passed my test first time thanks to your guidance. Great guy and instructor who ensured he got to know me first before creating a lesson plan that was tailored to me. Also very flexible with booking times. Andy helped me feel confident throughout my learning with great ways of teaching. Very patient and understanding of a learning driver. He was just amazing and i feel lucky to have had such a great experience learning to drive. I managed to pass first time too! Had very little time to get my lessons in before my test but Andy was very understanding about it and planned out the best method for me in that time .Felt very comfortable with him in the car and he had great teaching methods would highly recommend him. And best of all passed my test with very few minors so I was well pleased. Saadat is an amazing instructor. He taught me from the beginning and I passed after 28 hours of driving lessons thanks to him. He is very calm and his teaching formula's are spot on! Learn with Saad if you want to pass first time! Andy is a patient and professional instructor. He ensured that I was completely prepared for all eventualities that may have occurred during the test by preparing challenging and enjoyable lessons. I would recommend Andy to anyone who is looking to learn how to drive from a top class instructor. Quality instructor and a top man. He made the lessons fun and enjoyable. Trust Saadat and this man will get you through your driving test first time! Quality instructor, all my mates are coming your way. Don't worry about the referral fee :-) Thanks for all your help. Your instruction and knowledge was spot on. Booooooooom - I have a driving licence because of you Saadat!